2018-19 Our First 2 year Catalog! 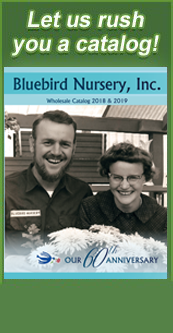 The cover picture on our 2018-19 wholesale catalog is of Harlan and Shirley Hamernik, founders of Bluebird Nursery. The picture was taken by and published in the Omaha World Herald newspaper in 1967, promoting 'Centennial' mum from renowned Nebraska breeder Glenn Viehmeyer to celebrate Nebraska's Centennial. Since we did not publish a new catalog for 2019, a '2019 Wholesale Supplement' has been mailed with any changes for the new year. We welcome our customers, both long-time and new! Please, browse through our extensive line of plant product we offer, right here on our website at your convenience. For our wholesale customers, don’t forget to use your login and password to check prices and availability here as well. If you don’t have access to this, request it by clicking on Wholesaler Login and simply filling out your basic business information. Don’t forget to ask about our custom growing options for your special requests and landscape projects. We have outstanding facilities to grow plant material in your requested sizes or large quantities, provided we have adequate advanced notice. Fall is a great time to get those orders in as that give some of those slow-growers some extra time to be ready for you next season! Call and inquire about custom growing options today!! We look forward to another year of serving you, our loyal customers! Thank you for your business and friendship!